If your planning on joining the other estimated 15 million people and planning a trip here, we have all the Bangkok information you need. Bangkok is a destination in it’s own right as well as a hub for Asian and Pacific rim destinations, meaning visitors here can stay from anything from 1 day through to several weeks. 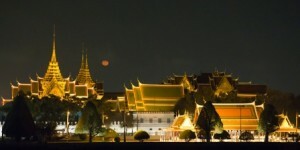 Bangkok is rightly one of the most visited cities in the world. Its eclectic mix of Asian tradition and new world capital, makes it one of the most diverse places on earth. Whether you’r visiting for it’s world renowned food scene, cultural heritage, amazing nightlife or top notch shopping we have all the Bangkok information you need to make your trip perfect. Bangkok is connected to the rest of the world via it’s 2 international airports. These 2 airports serve an estimated 50 million passengers a year. They directly connect Thailand to the rest of Asia, Europe, Australasia and the Americas. Don Mueang (DMK) Airport was Bangkok’s main airport until 2006, and exclusively handled all of the cities visitors. Having operated commercially since 1914 Don Mueang airport is Asia’s oldest commercial airport. Lying just north of the capital this airport now mainly caters for the shot haul market, connecting Bangkok with the rest of Thailand and South East Asia. The airport is connected to the center of Bangkok via public bus and train services. Both of which cost 30baht and run every 20 mins from 0600 – 2200. Public taxis are also available from terminal 1, make sure you only pay the metered fare and the 75 baht airport surcharge. Suvarnabhumi airport (BKK) is Bangkok’s newest airport which opened in 2006. It has quickly become one of the of top ten airports in the world by traffic numbers and handles around 50 million passengers a year. The airport lays to the south of the city center. 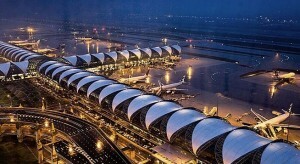 Survanabhumi is now Thailand’s main international airport and handles all of the countries long haul traffic. Getting to and from the airport is possible via public bus or public train. Public metered taxis are available outside the main terminal. Bangkok is not only Thailand’s capitol and largest city, it is also it’s cultural and spiritual hub. The cities ability to merge the old with the new means that nestled among the sprawling glass skyscrapers are some of the best temples and cultural sights in Asia. The people of Bangkok are very proud of the Buddhist religion and this is evident all across the city. Wherever you turn you will come across beautiful temples, shrines and other religious monuments. Many of the temples here are open to the public and in fact many rely on this income source to maintain their beauty. Any visitor to Bangkok should out of respect, visit at least one of Bangkok’s temples whilst here. When visiting one these sights you should be respectful of their religion and dress appropriately. This means covering the knees, shoulders and closed shoes only. Also please refrain from smoking, drinking alcohol and being loud whilst in the temple grounds. Being located in the tropics means Bangkok’s climate is tropical and can be categorized into 3 seasons, Dry, wet and cool. The cool season runs from mid November through to February and although called the cool season temperatures are still in the late 20 to early 30 degrees (82 – 95 F). The humidity is less during these months making it much more tolerable. The wet season runs from July through to the end of October. During the rainy season temperatures remain high and the humidity can be stifling, the only relief coming when the air breaks and the downpours begin. When it rains during this time it really rains with inches falling in a matter of hours. The rains often come in the afternoon when temperatures are at their hottest. 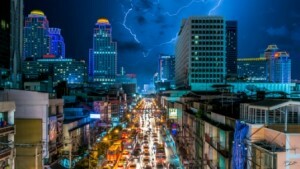 Lying at sea level makes Bangkok particularly prone to flooding during the rainy season. The hot season is from March through to the end of June, during this time temperatures can stay in the mid 30’s for days on end. The air is dry and the city offers very little relief from the blistering heat during these months. The only welcome respite is the cooling bliss of the cities air conditioned shopping malls and hotels. It is no wonder that the hot months are also the quieter months for tourist numbers. Bangkok is really Thailand’s only metropolis and as such plays a vital role in the countries economic well being. The city is worth a reputed 30% of Thailand’s GDP. The cities wealth is generated from Tourism, Finance and the world trade through Bang Lamung port. The wealth divide in the city is huge, with some of Thailand’s wealthiest aristocratic families living side by side with some of the countries poorest people. This gives the Thai’s constant drive to make money and the city really is a city of entrepreneurs. Bangkok is home to thousands upon thousands of privately owned business’s from street corner stalls to world famous brands such as Red Bull and Singha.